This chapter focuses on Autism Spectrum Disorder (ASD), a designated disability that is becoming more common in schools in the United States. Autism spectrum disorder, as the name suggests, covers a range of symptoms. Some students with this disorder are high functioning and, although lacking in social skills, can be educated in the general education classroom. Students at the other end of the spectrum need someone to assist them with daily living skills and are often non-verbal. 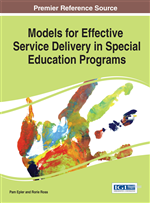 The chapter includes a discussion about effective service delivery models for students who have ASD and provides two case studies that use a behavior intervention service delivery model. The chapter also presents intervention strategies that can assist the general education teacher in providing proper help to students with autism spectrum disorder. Finally, the chapter discusses future trends surrounding this disability. According to the United States Department of Education, National Center for Education Statistics (2012), there were 378,000 students with a diagnosis of autism spectrum disorder (ASD) in United States schools during the 2009-2010 school years. This type of disability has increased significantly during the past 15 years. During the 1999-2000 school year, students with special needs who had an autism spectrum disorder diagnosis were at 0.1% of the total school population, which increased drastically to 0.8% during the 2009-2010 school year. This type of disability tends to target more males than females and “exists at approximately the same level in all racial and ethnic groups” (Friend, 2011, p. 303). According to the Centers for Disease Control and Prevention (2014), “1 in 68 children (1 in 42 males; 1 in 189 females)” (para. 2) are diagnosed with an autism spectrum disorder. This disability is very broad and diverse in that the intelligence of these students can range from below 70 in about one-third of the cases to at or above average in approximately 50% of the cases. Within the ASD category, there are three subcategories. The first subcategory includes autistic disorder, which is “reserved for individuals who display social interaction and communication impairments as well as repetitive, stereotypic, and restricted interests and activities prior to thirty-six months of age. This disorder is accompanied by a moderate to severe intellectual disability” (Friend, 2011, p. 300). Asperger syndrome is the next subcategory and is characterized by “impairment in social interaction” (Friend, 2011, p. 301). Students who fall into this group typically do not have any difficulty speaking but are challenged to act appropriately in social situations. The last subcategory is called the Pervasive Developmental Disorder Not Otherwise Specified (PPD-NOS). According to Friend (2011), this category is used when “there is a severe and pervasive impairment in the development or reciprocal social interaction association with impairment in either verbal or nonverbal communication skills or with the presence of stereotyped behavior, interest, and activities” (p. 301). This subcategory is normally reserved for children who do not display autistic characteristics until they enter school. Autism spectrum disorder is a relatively new disability category under IDEA, as it was only added to the list in 1990. As a consequence, schools and health care officials are still trying to figure out the best research-based educational and behavioral intervention strategies for educating these students. For many children, symptoms improve with treatment and with age. Children whose language skills regress early in life—before the age of 3—appear to have a higher-than-normal risk of developing epilepsy or seizure-like brain activity. During adolescence, some children with an autism spectrum disorder may become depressed or experience behavioral problems, and their treatment may need some modification as they transition to adulthood. People with this type of disability usually continue to need services and supports as they get older, but many are able to work successfully and live independently or within a supportive environment (National Institute of Neurological Disorders and Stroke, n.d.).